Pachycephalosaurs are most famous for their thick, bony skull caps for which they are named. They are a bizarre group of herbivorous dinosaurs that lived during the end of the Cretaceous Period. Pachycephalosaurs include several different species that range in size from 3 feet to 26 feet in length. The largest of these dinosaurs is the species Pachycephalosaurus. All pachycephalosaurs were bipedal, plant-eating ornithischians that possessed a very thick-boned dome in the top of their skulls. The height of the dome varies amongst species as does the ornamentation to the skull. 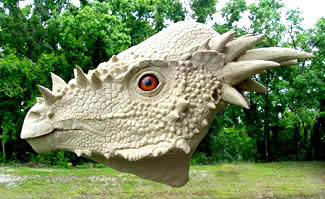 Variations include spikes, knobs and bony frills to different regions of the head. All had five-fingered hands, three-toed feet and a long, stiff tail for balance. They possessed small leaf-shaped teeth which lead researchers to believe this dinosaur ate leafy plant material as well as insects. There are two schools of thought as to why these amazing creatures had the thick bone dome to the top of their skulls. Some scientists believe pachycephalosaurs butted heads like modern day rams do. Others counter that the skull and bones were not designed for such impact. 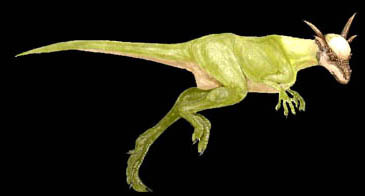 Other hypotheses explain the skull was used for ramming the flanks of predators in defense and possibly, in fighting amongst other pachycephalosaurs. Since the impact would have been less in flank-butting rather than direct head-to-head collisions, this seems like a very plausible explanation for the rigid dome. Mountain sheep ram each other with their large horns but they have air spaces in the front of their skull to absorb the shock of impact, pachycephalosaurs do not and the bony dome is solid all the way to the brain. Head-butting with such a skull would send severe shocks to the brain that would likely cause damage to the organ. 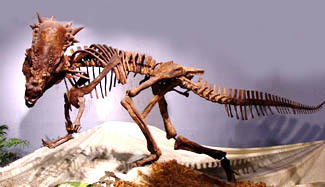 Possibly, shock was diverted to the neck vertebra by off-center blows but the overall graceful nature of the skeletal structure suggests that these were not robust, fighting creatures. The elaborate head ornamentation and bony dome of pachycephalosaurs might have served as mere decoration for mating and other social behavior needs. One species known as Stygimoloch, had horns at the rear of the skull that grew up to 4 inches long. Clearly, these were more ornamental than practical weapons. One compromising theory is that like bulls, these dinosaurs met heads in a challenge of pushing rather than ramming. The most identifiable isolated finds of pachycephalosaur dinosaur fossils are the fronto-parietal bone skull domes which are rare but occasionally found. Teeth are also found in microsites. Post-cranial pachycephalosaur fossils remains are very rare. Pachycephalosaur fossils have been found in North America, England, Madagascar, China and Mongolia.